A report sent to me last week on degree apprenticeships in England points to the challenges we’ll have here in Australia in establishing a tertiary education system. Whether it’s a tertiary system (unified in governance, regulation, funding and esteem), an eco-system of co-existing or co-dependent parts, or better-connected vocational education and training and higher education is up for debate here in Australia. Much has been made of higher-level apprentices in Australia catalysed by the English Degree Apprenticeship. The English model was developed off the back of a levy introduced in May 2017 requiring 0.5 percent of payroll of companies with a wage bill over £3 million to be put into degree apprenticeships. Smaller companies pay no levy but can participate, with the government covering about 95 per cent of the cost. The report is by the Higher Education Commission, an independent body comprising representatives from business and higher education. Candidates study toward a degree while also placed in work, mainly in professional and para-professional occupations. The term ‘degree’ is central. And as a result, the courses are run by universities. The programs that have got off the ground with reasonable numbers are those for large employers. Non-levy employers, or small and medium enterprise employers, rely on the government approving universities to deliver the training but this has been spectacularly slow. Each program relies on agreed industry standards for the apprenticeship. The Commission’s feedback on standards development will be familiar to Australians. They take too long to prepare and to be agreed and there’s concern they don’t relate sufficiently to the needs of the industry. Universities complain that the paperwork to sign-up apprentices is too cumbersome! Overall though, the scheme to date appears to have been a major equity failure. There are no pathways, so potential candidates who have lower level qualifications struggle to get access, let alone have their achievements from elsewhere recognised. Big employers have had success at the cost of SMEs. And candidates from regions which do not have the large employers struggle to gain access. And, it suffers from an identity challenge. While the scheme is recognised as high merit, candidates are put off by the term ‘apprentice’. Innes Willox, CEO of the Australian Industry Group released last Friday a report Realising Potential – Solving Australia’s tertiary education challenge. 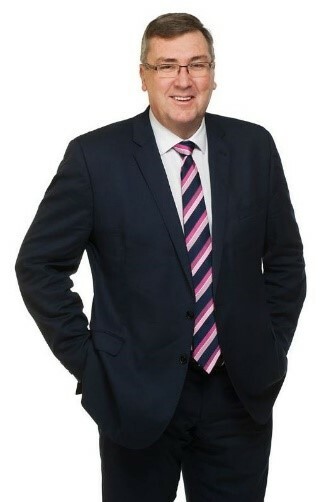 Innes argues for a coherent and connected tertiary sector where the merits of vocational education and training and higher education are equal for Australian citizens. The commission’s report shows this will not be easy. Long held prejudices, entrenched policy mindsets and rent seeking are just some of the barriers. The spirit of Darryl Kerrigan springs to mind – ‘tell him he’s dreaming’. But we love the under-dog and the fair go, so maybe the VET sector can be the proud castle of the Australian tertiary education landscape!! There’s a lot of work to be done, however. In last week’s newsletter we over-played ASQAs cancellation of 11 RTOs. Some RTOs rectified what appeared to be minor issues and their registration was retained. It seems the revocation of a decision is not as prominent on the ASQA site as the notice of cancellation, at least to us in TDA. See the article below for an explanation. The tight financial squeeze on much of the VET sector has been highlighted in the latest report of the Productivity Commission, which shows most states doing more with less funding. In its Report on Government Services – Vocational Education and Training chapter released on Friday, the Productivity Commission analysis shows that government funding of VET has not kept pace with the demands being placed on the system. It analyses movements in government recurrent expenditure per annual hour – a measure of what is being delivered at what cost, which can also serve as a measure of efficiency. 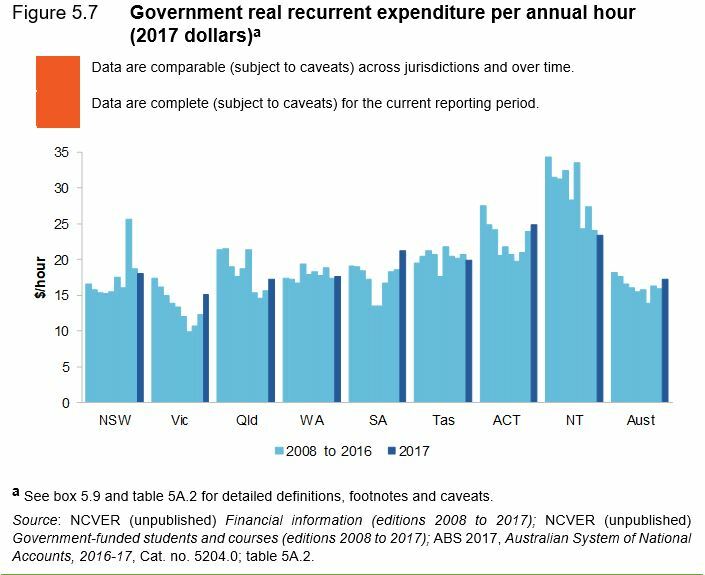 It says that since 2008, government real recurrent expenditure has increased by just 0.4%, while the number of government‑funded annual hours (adjusted for course mix) has increased 6.3%. “The annual movements resulted in a decrease in recurrent expenditure per annual hour from $18.20 in 2008 to $13.95 in 2014, before increasing in 2015 and was $17.19 in 2017,” the Commission says. Federal, state and territory government recurrent expenditure on VET totalled $6.1 billion in 2017, a real increase of 2.2 per cent from 2016. Nationally, for government‑funded 2017 VET graduates, 82.9% reported that training helped to fully or partly achieve their main reason for training, the highest figure recorded in the five years of annual data in the report. In 2017, an estimated 4.2 million students participated in total VET and around 1.2 million students participated in government‑funded VET. See the Productivity Commission’s Vocational education and training report. TAFE Queensland has joined with the state government and seven universities in a landmark agreement to train Chinese doctors and allied health providers across a range of courses. Premier Annastacia Palaszczuk said the three-year deal would see TAFE and the universities paid by China to train their doctors and other health experts under the government’s new Assist Chinese Healthcare Reform project. “This is about sharing our expertise in healthcare and converting it into economic growth and new jobs for Queenslanders,” Ms Palaszczuk said. The premier said the deal would generate $50 million over the next ten years, with each of the consortium partners contributing $297,000. “The 2-3-week training courses for not only doctors but senior and mid-level hospital administrators, specialists and GP’s, will be offered across a whole range of medical disciplines,” the premier said. The consortium chair, QUT’s Deputy Vice-Chancellor Professor Scott Sheppard said the project neatly brings together international education and training with the huge potential of the global healthcare sector. In April, consortium members plan to identify training opportunities in three provinces of China – Guangdong, Shanghai and Zhejiang – with the first Chinese medics commencing their training next year. Governments are investing $91 billion in education and training annually, yet almost a third of young Australians are unemployed or underemployed, according to new research released by the Foundation for Young Australians (FYA). The research, undertaken by AlphaBeta calculates that the high rate of youth unemployment represents a loss of more than $4.5 billion a year. FYA CEO Jan Owen said that with 70% of young people currently learning skills that will be redundant by 2030, the mismatch between skills supply and demand is one of the country’s greatest challenges. “We must transform our approach to learning so that current and future workers have the skills employers need and the cultural competencies required to thrive. “This includes foundational skills, technical or job specific skills, career management capabilities and enterprise skills – often called ‘soft’ or ‘21st century’ skills,” Ms Owen said. FYA is proposing a national discussion with all the key players to create a four-part Future Skills Framework 2030. “Without an integrated approach we are likely to end up with even greater problems, with employers, education and training providers, workers and the national economy all losers,” she said. In last week’s TDA newsletter, we reported on a January announcement by ASQA citing 11 private training colleges that had their registrations cancelled. We are pleased to correct the record and apologise for the misreporting. There has been a strong start to the Victorian government’s free TAFE initiative, with some 3000 people enrolling in courses to date. Visiting Chisholm Institute in Frankston, Premier Daniel Andrews said that approximately 1000 people had commenced ‘Free TAFE’ training at Chisholm in January, compared to just 91 students who were enrolled in these priority courses last year. “Demand for Free TAFE courses has been so strong that Chisholm has added more classes in the coming weeks to keep up with demand,” Mr Andrews said. He said data show there has been a three-fold increase in student numbers in Free TAFE courses across Victoria compared to last year. More than 800 of those were in pre-apprenticeship classes. The top five courses for Free TAFE commencements were Diploma of Nursing, Certificate II in Plumbing (Pre-apprenticeship), Certificate IV in Accounting and Bookkeeping, Certificate IV in Disability, and Certificate III in Individual Support. TAFE Queensland has commenced its Rural Support Training Program for 2019 which is helping to support farmers and communities affected by drought. The program provides training opportunities for farmers to assist them with their farming operations and increase opportunities for off-farm income. Five different programs on offer provide training in areas including work health and safety, chemicals, chainsaws, hospitality, Microsoft skills, and pre-employment skills to help gain employment in the construction, infrastructure and resource industries. The first program was delivered in Gatton in December and future rounds are planned in the next few months at Goondiwindi, Roma, St George, Toowoomba and Cunnamulla. TAFE Queensland chief executive Mary Campbell said the drought has affected the majority of Queensland, and with no immediate signs of reprieve. The Skills Service Organisation, Australian Industry Standards is seeking feedback on 13 draft Units of Competency for the Cross Sector Supply Chain Skills project, commissioned by the Australian Industry and Skills Committee (AISC). The goal is to develop a range of Skill Sets and Units of Competency for those supply chain skills common to a range of industry sectors and in doing so, support the mobility of skilled labour and agility of the workforce. It will enable the many individuals working in a supply chain to be skilled to the same world class standards and, as a consequence, increase industry efficiency and productivity. The project is led by a Project Reference Group comprising representatives from across a range of industries. More information can be found on the dedicated project website, and Units for comment can be viewed or downloaded here. The draft units are available for comment until 13 February.